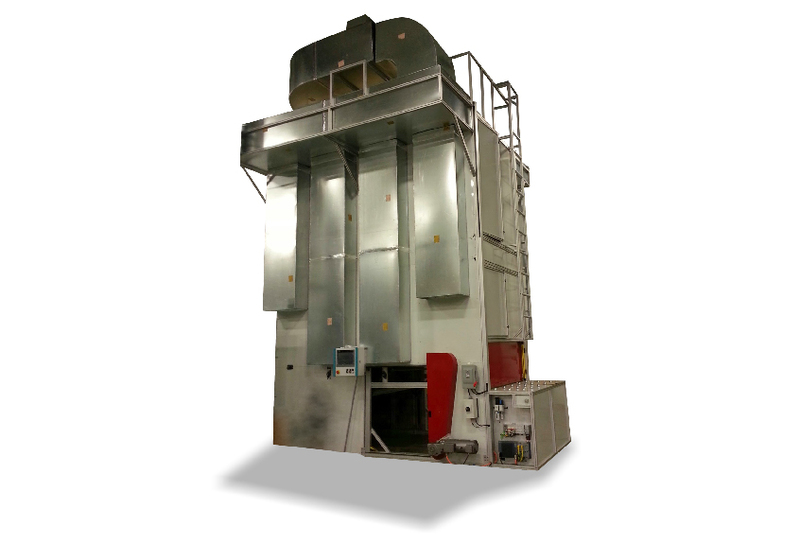 Fitz-Thors Engineering - Industrial Vertical Drying Ovens - Birmingham, AL — Fitz-Thors Engineering, Inc.
Our customer required a high volume drying chamber prior to the curing process of their water-based adhesive, but had limited floor space available. For the given footprint, the typical conveyor-style dryer design does not have capacity for the number of parts required to maintain their current process time. Our solution was to design and build a vertical Paternoster-style drying oven that would fit inside the available footprint. The moisture in the system is removed via a Nyle Systems refrigerant dehumidification unit located on top of the drying chamber. A PLC ensures the oven maintains the required temperature and humidity, controls the internal conveyor movement, and coordinates entry/exit operations. To load the oven, an operator places a part onto one of the twenty cradles then closes the door with a button press. On the opposite side of the oven, another operator removes a dry part and closes the exit door in the same way. The PLC ensures both doors are safely closed and retracts part-loading rollers before indexing the system to the next cradle for loading/unloading.